TAB talks to English artist Jane Dixon, who is holding her second exhibition at Tokyo Gallery + BTAP. In September 2004, Jane Dixon held “Under False Colours”, a solo exhibition of her newest paintings and prints at Tokyo Gallery + BTAP and Yokohama Portside Gallery. 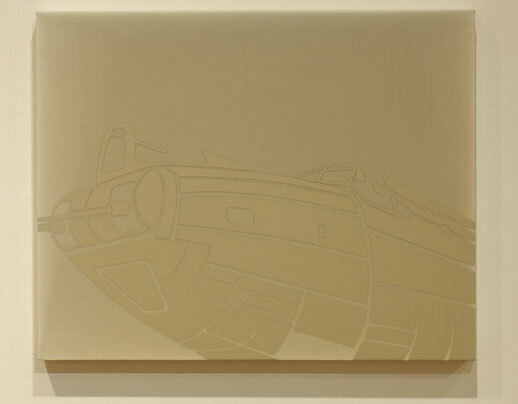 The show was conceived as an integration of two series of paintings – the Warplane Series (2001-2003) and the Camouflage Series (2003-2004) – both of which deal with dichotomies of protection and vulnerability. The title refers not only to the military origin of the imagery (a reference to the military practice of sailing ships under the enemy flag to avoid attack) but also to a much wider association with the nature of ambiguity and deception. 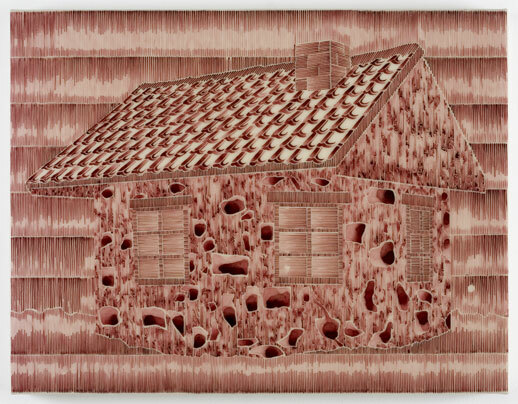 In her current exhibition “Regeneration”, she is showing a body of work that explores the damage and repair of cities and buildings, The images are concerned with the disappearance and replacement of physical structures, the substitution of one thing with another in both our physical world and collective consciousness. The Regeneration project is large, ongoing and organic in structure, a reflection of its subject. Production was begun in 2006 following an Arts Council of England award and has resulted in numerous showings of individual works internationally and acquisition by the British Museum department of Prints and Drawings amongst others. There currently exist works on paper and larger composite pieces with photographic and painted works in development. 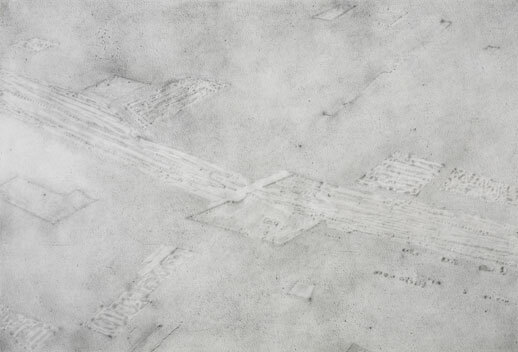 The exhibition at Tokyo Gallery + BTAP is the first solo show to be mounted of work from the project and contains both series of prints (including a specially conceived installation of the Braille Suite) and a selection of the Ground Plan and Floor Plan drawings. How did you come to exhibit at Tokyo Gallery and Yokohama Portside Gallery in 2004? Between September 2000 and September 2001 I was living and working in Cambridge as the Artist Fellow of Kettle’s Yard, University of Cambridge. During that time there was an exhibition at the gallery, Kettle’s Yard, of work from the Japanese ‘Mono-ha’ artists, a number of whom are represented by Tokyo Gallery. The artists visited Cambridge for the exhibition, along with a number of Tokyo Gallery staff, one of whom came to my studio there. About a year later, after I had completed my residency and returned to live and work in London I received a second visit, this time also from one of the gallery directors, who invited me to exhibit in Japan. I was preparing a large exhibition at the time, “Under False Colours”, for a public gallery in the UK, the Djanogly Art Gallery in Nottingham and this was the work that was seen in my studio. “Under False Colours” was made up of 27 paintings and 4 prints, making it too large for Tokyo Gallery alone, so they proposed organizing two simultaneous shows that would be able to show the whole body of work; one at Tokyo Gallery, the other at Yokohama Portside Gallery. “Under False Colours” consisted of two series of work – the Warplane Series and the Camouflage Series. Can you tell us something about these two series and how they differ? The warplane paintings really were developed from a previous series of work I’d made in the late 1990s relating to body armour. I’d started to explore in that series the idea of working with separate transparent layers of paper stained with colour and then constructing an image one on top of the other. The colours were taken directly from the negatives of colour photographs of the objects so they were a combination of very bright blues and purples and greens, with everything suffused in a strange orange light. They appear to be a very artificial set of colours for the objects concerned but of course they are based on the actual colours of the objects and have been transformed through a chemical process into what we see on the piece of negative film. What drew you to using negative film? It’s that marriage between the real and the artificial that really excites me. Apart from the colour there is also the whole sensibility of something that’s transparent that I find appealing. To make something that is so solid and inherently physical into something that is very ephemeral is a very attractive idea for me. You used negatives as the starting point for making the Warplane Series as well, didn’t you. Yes, these small negatives inspired me and I knew I wanted to take the idea further in another series. I frequently work with images of machines or mechanized objects, usually ones which relate to the human body and human experience and I’d been thinking for a long time about the idea of using warplanes as metaphors through which to explore the idea of human vulnerability. The paintings take as their starting point the structure of warplanes, usually obsolete ones which are decaying into a kind of skeletal form. 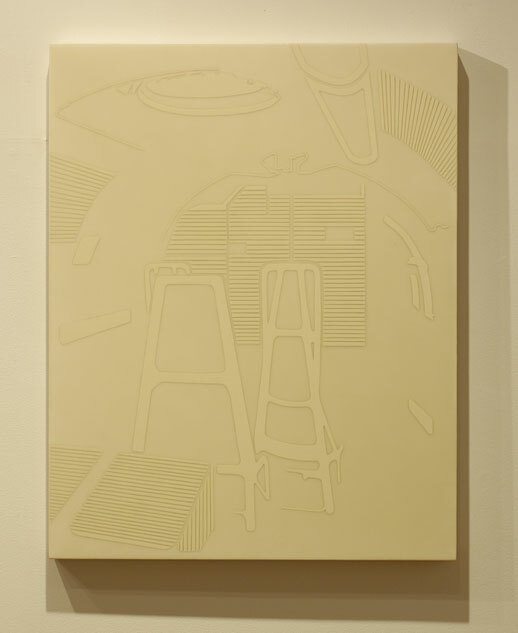 The separate layers that previously constituted the image in the Armour Series here gave way to a process in which the schematic form of a plane appears suspended in a series of translucent glazes, provoking a sense of life in suspension and the very physical realisation of vulnerability. The image is isolated yet optically continuous with its surroundings so that the physicality of the plane and the insubstantial nature of the air around it provoke ideas of absence and presence, the concrete and the abstract. The Camouflage Series was a group of paintings based on photographs of decoy and camouflaged buildings from the Second World War. What motivated you to use these structures as the subject of these paintings? My interest was in the visual deceit. These buildings were improbable structures made to look as benign as possible whilst concealing arms stores or military installations. I wanted to explore visually the inherent trickery in these buildings their representation of the pretence of something to be that which it is not, so making the viewer vulnerable by its deceit. Once again, as with all my work, there was a very strong conceptual alignment between subject and method, the ambiguous relationship between integrated surface and the structure of marks, the fragile ink image which floats on the surface creating a lightness and contrast with the nature of the original object. The ‘fake’ solidity of the image is revealed as the engagement of the viewer increases. For a number of years now you’ve been exploring the significance of vulnerability specifically in relation to war and using military imagery, can you say more about that alliance and how it relates to the Regeneration project? Well, I’ve always been interested in ambiguities, in the dividing line between one state of being and another. The dichotomy of absence and presence has often been an issue in my work: the evidence or trace of something which stands as a reminder of society’s vulnerabilities and also those of the individual. I’ve used imagery that has a military origin, the protective ‘skin’ of body armour or the fragile structure of a warplane, partly because war is, I think, universally seen as the ultimate state of human vulnerability, I’ve also used medical imagery in the past which in a sense was approached from a similar standpoint of being on the borderline between something protective but potentially invasive. The metaphor of the city and of isolated buildings is, for me, an interesting one in that they contain elements of both the past and future; they are in a sense transitional in spite of their physicality and so the use of photography as source material seems apt for me because of it’s inherent paradox of making something which is fleeting, a moment in time, permanent. I’m aware that the cities I am photographing have, on the whole, already been regenerated after destruction or damage and so I am working from a pivotal position of reflecting on the past and anticipating a possible, changed future. Did your previous visit to Japan, which was your first, influence your work in any way after that? My visit to Japan in 2004 was a huge influence on me in many ways. I tend to absorb stimulae and then find that it emerges in my work sometimes many years later and so I expect that there will be elements from that experience coming to the surface in the future. At the time though my visit had a direct influence on the Regeneration body of work I was planning. For a number of years before, I had been photographing cities that had been damaged or destroyed by war or other man-made or natural causes. I had been looking at Berlin and Chicago, for example, and found that the images I took of Tokyo and Yokohama during my stay brought a new dimension to the ideas I had been having for the work. It also seemed to me that the Japanese have a particular respect or even reverence for the temporary and for temporality, and this intrigued me. There was the specific example of the Ise Shrines and their ritual renewal but also something which seemed much more within the fabric of sensibility here, the use of paper and wood in building for example, perhaps a built in awareness of structural vulnerability in a country accustomed to earthquakes but also an acute acceptance of the changing nature of all things. I found this very in tune with the way I was thinking about the Regeneration work, which I began later. 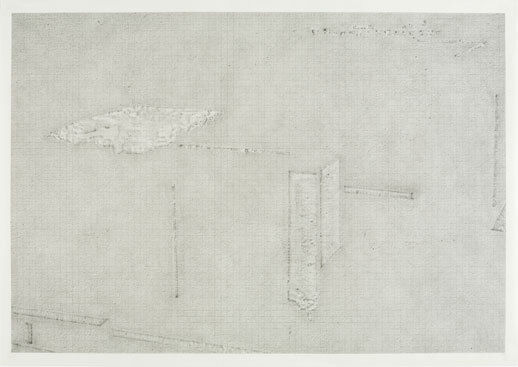 The new works that you are showing in the current exhibition – the Ground Plan and Floor Plan drawings, the Braille Suite of etchings and the Regeneration Suite of etchings – use very different techniques from the work shown in 2004. 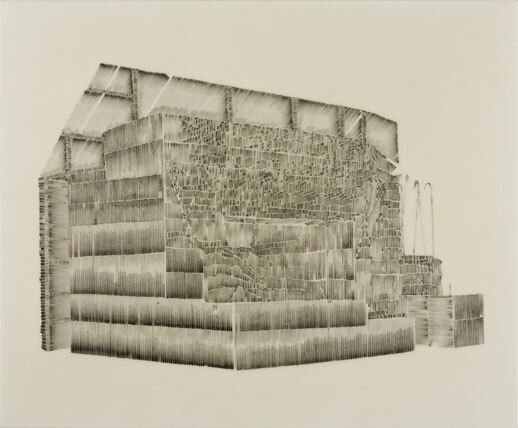 The drawings are made of layers of ‘rubbings’ and intensify the conceptual alignment between subject and method by relating the visual with some of the physical processes employed by archaeology or forensic science; for instance, the painstaking revelation of a surface or the analysis of the past through exposed layers. 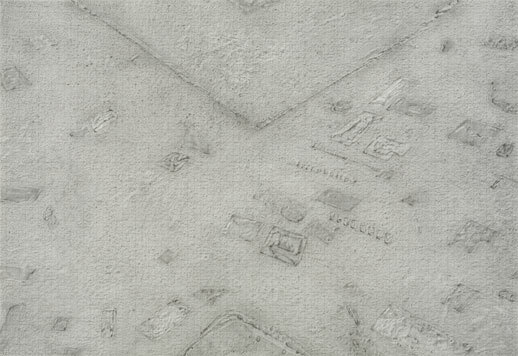 I think of the drawings as urban palimpsests. 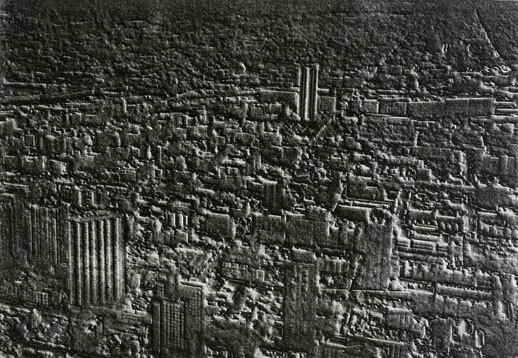 The layers consist of graphite rubbings or traces taken directly from the surfaces of existing buildings combined with rubbings from the surface of relief paintings I have made, based on my original photographs. The painting is later discarded, it’s for the process only. I’m interested in the drawings using the physicality of painting to create something ephemeral.The completed layers of the drawings therefore incorporate both the real and the manufactured. There might be three or four successive layers in different combinations in order to build up a network or tracery of marks. Sometimes the works refer to individual buildings, sometimes to cityscapes or to empty, ambiguous spaces, they are almost like artificial excavations. As well as the drawings, I am showing both of the print series that relate to Regeneration here in full for the first time. 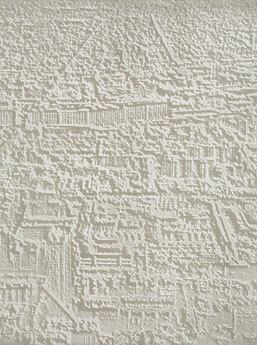 The Braille Suite is a set of five etchings based on five individual texts extracted from Italo Calvino’s book Invisible Cities. I then had these extracts transcribed into Braille and printed them as blind embossed etchings. Presented in a language of touch rather than sight, they make the cities they describe inaccessible to us: at once found and lost. A new addition to the installation of the Braille Suite that I’m making especially for the Tokyo Gallery show is a corresponding set of five rubbings, taken primarily from the etching plates which were used to make the prints. These will refer to the idea of descriptive plaques or image information conventionally used to accompany works. In this case of course they will serve to further confound the meaning and contents of the prints. I want to push the sense of intangibility as far as possible and it also takes the concept of translation and transcription a stage further, outlining the subtle nuances of meaning and fact that are lost or changed in translation or language, even visual language. 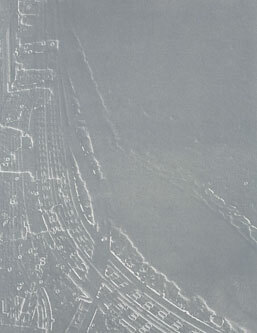 The Regeneration Suite is a set of four etchings which utilize most directly the photographs of specific cityscapes, three of Chicago and one of Yokohama. I took the original film photos and digitally manipulated them to increase the appearance of the basic physical structures whilst losing any information that was building-specific. I then photographically transferred the resulting images to etching plates and printed them by hand. This process increases the discrepancy between visual and physical three-dimensionality and highlights the dialogue and relationship between the digital and the analogue. Well, as I’ve mentioned, the Regeneration project is ongoing and so the new groups of work are still being produced. I plan to show that work at a later stage and also re introduce some of the current works on paper in order to re present the whole project. What I’m also interested in developing is an exhibition which would work in a similar structure to a show I curated for Kettle’s Yard in Cambridge in 2001. That show was called Solid State: reflections upon the real and it was conceived and constructed in the way I would approach making a piece of artwork: it incorporated other contemporary artists like Cornelia Parker and the film maker John Smith, older works, for example by Naum Gabo and then archival photographic imagery and scientific material. It was examining what it means for something to be ‘real’. All the exhibits seemed to me to incorporate a conceptual or physical exploration and use of the marriage between sujbject and method in order to express some aspect of reality. I’d really like to have the opportunity to approach curating a show again in that way but this time in connection with Regeneration: to look at archaeology, imaging and scanning, architecture and forensics in relation to artworks, my own and others’. I’m working to gradually find the right venue to collaborate with and develop this idea in the future. To see more of Jane Dixon’s work, including images of the Braille Suite mentioned in this interview, see her website here.